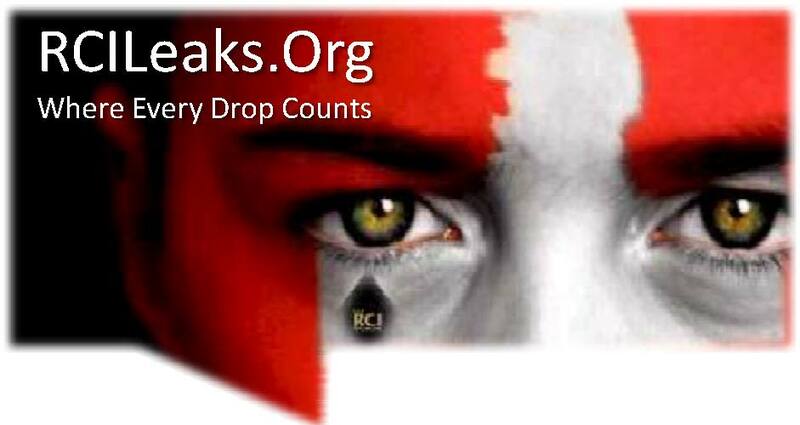 RCILeaks.Org, Where Every Drop Counts - Welcome to RCILeaks.Org, Hear us roar! As a public service for those conducting due diligence on RCI Capital, its associated companies and principals, an all new RCILeaks.Org 3.0 version online in mid April 2014. @RCIisLeaking Don't people have to sign passport declaration that the information is true & accurate ? Isn't that passport fraud? Some desperate men can be bought for a mere pay check. Imagine what they will do if threatened by 'powerful' people, or offered a substantial bribe to buy their silence or collusion. Will they take the risk, and get caught in a lie? BACKGROUND ON BREAKING NEWS: British Columbia Premier Clark tied to scandal involving RCI Capital Group Inc. for which she once worked but never divulged. She's undertaken many activities since becoming Premier that financially benefit this BC corporation owned by reputed Vancouver bankster John Park. According to a April 1, 2014 report in the online Vancouver Observer titled, "Christy Clark partnered in Enbridge lobbying firm before becoming BC premier," Clark was revealed as a bonafide partner along with her husband in a family lobby firm called Burrard Communications Inc. Public records show that Burrard lobbied both the governments of B.C. and New Brunswick on behalf of RCI. Regardless of whether Clark personally lobbied any clients, provided strategic advice to her partner and staff or clients, or merely passively derived revenue from the firm's work for several clients - be it Enbridge, or RCI - as a partner in the firm and spouse of Burrard's president, Clark would still have benefited financially from all lobbying efforts undertaken on behalf of clients. She and her then-husband Mark Marissen were the only beneficiaries in the family lobbying firm whose registered address was the couple's home. Clark never divulged her partnership in Burrard when she became Premier. Now the National Post reveals her 2-year stint as chairman of a RCI Capital Group subsidiary called RCI Pacific Gateway Education Inc. as yet another previous corporate relationship and possible source of conflict she failed to publicly disclose. Clark's longtime association and connections with John Park and RCI continued to blossom after she became premier. RCI and Park financially contributed to her political efforts. Premier Clark witnessed a RCI MOU in South Korea in 2012 (a photo of Clark and Park at an RCI MOU Ceremony in Seoul briefly flashes on video screen of a Korean Center for Investigative Journalism probe into RCI that aired on Dec. 17, 2013) . More recently, in Nov. 2013, RCI was hired to assist Clark's government by having RCI director Stockwell Day and RCI managers for some unknown reason intervene to arrange a BC government wood products MOU in China. This when it is known there were lots of qualified BC government staff on the ground in China who could have easily done the same. On October 23 2013, Clark traveled to Vernon B.C. to promote SST Wireless Inc., a private technology company that had only recently been taken over by RCI owner John Park. A press release by Premier Clark also announced $50 million Clark government technology fund called Southern Interior Development Initiative Trust (SIDIT) invested in SST Wireless. This all happened subsequent to RCI's John Park taking control of the firm. Clark participated in a press conference and video posted online by the company's president that promotes SST's technology. SST is rumored to be in the early stages of and IPO so Clark's endorsement would certainly help attract potential investors. RCI has strong ties to the Conservative Party of Canada with the Hon. Stockwell Day PC & Hon. 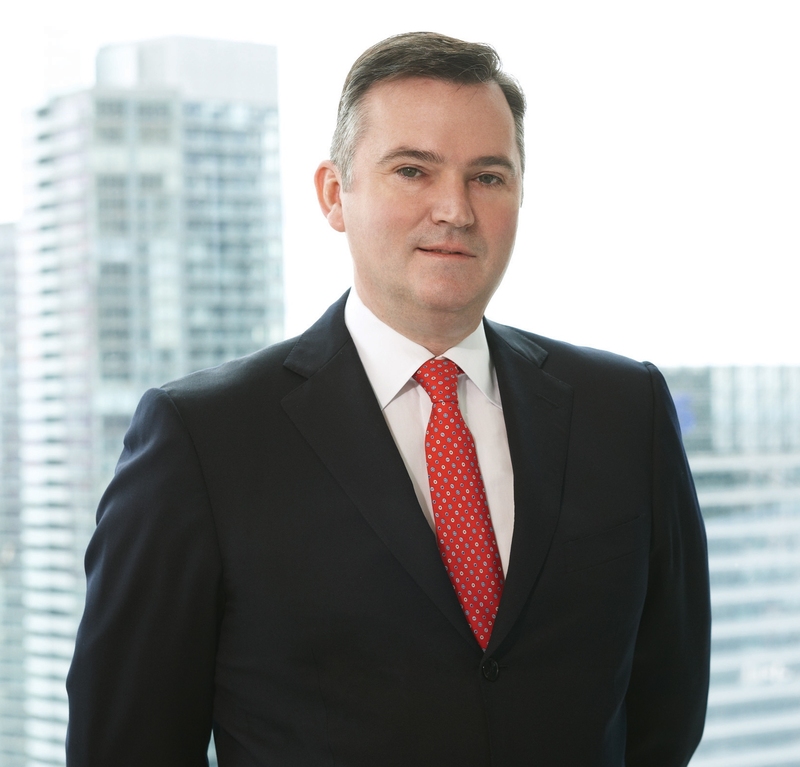 John Reynolds PC being RCI Capital Group directors. Former Jason Kenney and Tony Clement Chief of Staff Tenzin Khangsar has worked as Managing Director of RCI since Sept. 2012. Khangsar and RCI Driector Day worked on Ms. Clark's May 2013 re-election campaign and Khangsar was rewarded with an appointment by Clark to become Chair of the B.C. Multicultural Advisory Council in December 2013. CLICK HERE TO READ NATIONAL POST ARTICLE. READ APRIL 11, 2014 TYEE ARTICLE PROVING JOHN PARK LIED. 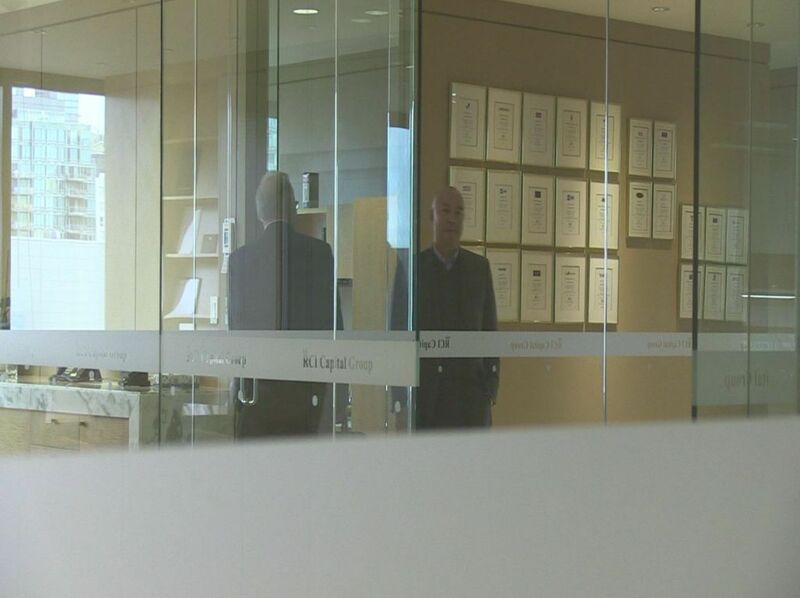 (CLICK TO ENLARGE) Screen grab of seldom photograhed Tenzin Khangsar caught on video as he eyed Korean Center for Investigative Journalism (NewsTapa) reporters from behind glass walls of RCI Capital Group's Vancouver Head Office. RCI was under tightened security and 'lock-down' while the investigative team were in Canada for a probe into alleged RCI financial improprieties that was broadcast on South Korean TV, Dec. 17, 2013. 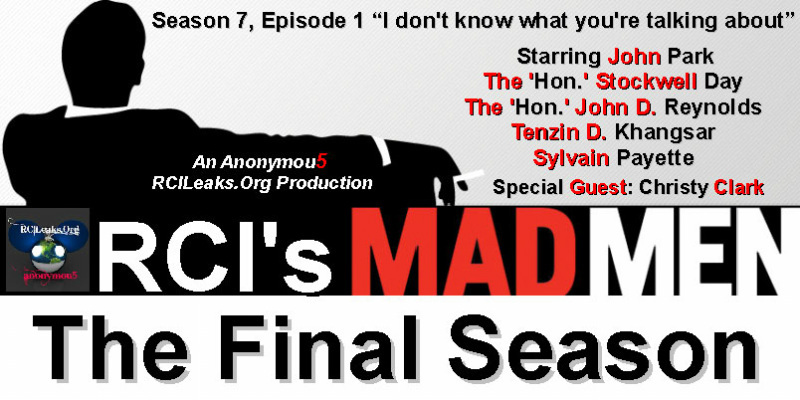 RCILEAKS.ORG EXCLUSIVE: RCI Capital Managing Director ﻿Tenzin Dargyal Khangsar﻿ has reached out to RCILeaks.Org to say he wants it publicly known that he has officially resigned from his position as Executive Vice President and Managing Director of RCI Capital Group Inc. effective Friday, April 4 2014. Khangsar, a long-time Conservative Party of Canada operative and Tibetan activist, was once National Coordinator of the Tibet Canada Committee. He joins former long-time RCI CFO ﻿Arthur Chan﻿ and Vice President, Investment Banking ﻿Philip Lee﻿ as RCI senior executives who recently quit the scandal-plagued immigrant investor group in the aftermath of a Dec. 17 2013 Korean Center for Investigative Journalism's Newstapa probe into RCI boss John Park and alleged financial improprieties surrounding a $300 million Korean government-owned KORES investment into a Vancouver-based mining corporation. Khangsar received an undisclosed severance package from RCI in exchange for signing a non-disclosure and non-disparagement contract with his former employer. Khangsar is on the witness list for an upcoming Vancouver trial before the BC Supreme Court (April 22) involving RCI Capital's John Park suing fellow directors who removed him as Founding Chairman of the Harper Government-endorsed Canada Korea Foundation (CKF). 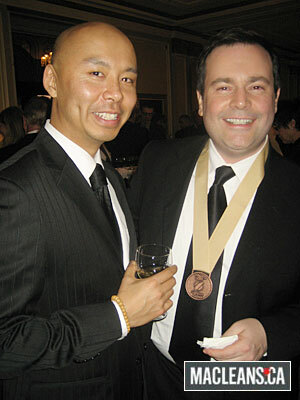 Khangsar was instrumental in helping his future employer John Park set up the CKF and have Prime Minister Harper, Jason Kenney, and Stockwell Day officiate at its February 2011 launch. Harper Senator ﻿Yonah Martin﻿ was also 'Honorary Patron' of the CKF but resigned as a result of the ongoing legal dispute between Park and the CKF. RCI Director ﻿Stockwell Day﻿ is also a Park-appointed Director of the CKF. Similar to the curious circumstances of the Harper government's SDTC fund investment along with RCI and T-Stone, a $50 million Clark government technology fund called Southern Interior Development Initiative Trust (SIDIT) invested into a Vernon British Columbia-based company called SST Wireless Inc. in 2013. RCI owner John Park happens to be Chairman of SST. As of mid 2013, Park somehow acquired the funds to takeover control of SST. Park then installed Korean-Canadian Vancouverite Christopher Chong as president of SST. At the same time Chong became president of SST in July 2013, Chong also was appointed as a director of Harper-aapointed Senator Yonah Kim Martin's K3 Society. Premier Clark took the trouble to visit John Park's SST Wireless (and it's partner Kal Tire) in Vernon on October 23, 2013 where she did a media conference lauding SST's technology. A video of her visit - great for SST's promotional purposes - can be found on YouTube. John Park is seeking investors for SST and eventually plans to take it public, with a little help from his friends, and 'favourable conditions' permitting. 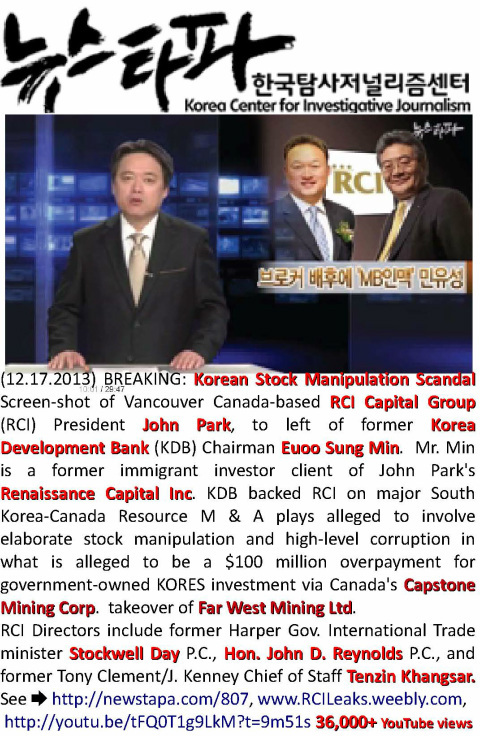 BREAKING NEWS (17.12.2013) An in-depth investigative report about RCI Capital Group Inc., and its owner John Park, broadcast via South Korean TV news on Wednesday, December 17, 2013. Stay tuned as the story continues to develop via Korean and Canadian news organizations in early 2014. The report by Newstapa, the International Consortium of Investigative Journalists (ICIJ)-affiliated Korea Center for Investigative Journalism (www.Newstapa.org), focuses on serious allegations around RCI Capital Group's recent Korea-Canada M & A dealings. According to Newstapa, there are serious allegations of possible fraud, stock manipulation, et cetera; much worse than the 2009 immigrant investor program marketing scandal in China that almost put RCI Capital and its primary operating subsidiary Renaissance Capital Inc., out of business. It is alleged that Korean government-owned KORES (or Korean taxpayers) may have artificially overpaid by as much as $100 million via inflated stock prices for the investment deal involving Vancouver Canada-based Capstone Mining. 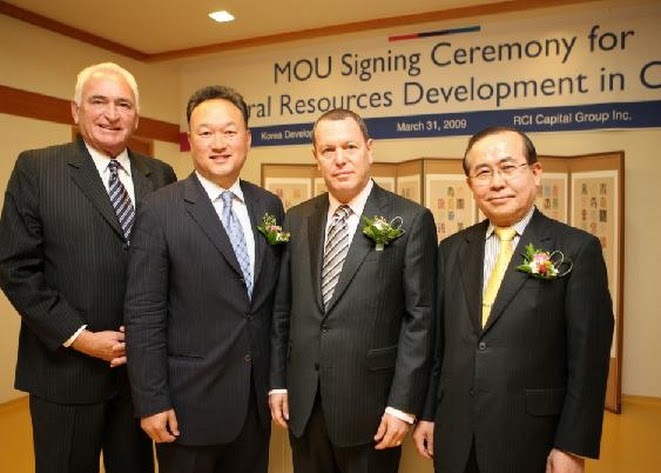 RCI Capital's John Park (AKA Park Sung Joon) worked in tandem with Min of KDB and helped broker the KORES investment with Capstone Mining Corp. via his representation of - or at least introduction of - KORES in the deal. Park legally received a CAD $1.65 million finders fee from Capstone for introducing KORES but it is speculated by investigators there is much more to the still developing story. Stay tuned. Link to related written and video reports via www.newstapa.com. The initial Dec. 17 2013 report is apparently only the first of several scheduled for broadcast and publishing. Other media outlets are expected to pick up on the developing story. Below is a direct link to the original 19 minute Korean language TV report. The first 9 minutes cover stock manipulation related issues and background, while from 09:54 to 18:57 in the broadcast, the focus is entirely on RCI and John Park's alleged role in the quickly developing scandal. Park's personal and business relationship with the now-replaced Chairman of the Korea Development Bank (KDB), Mr. Euoo-sung Min (AKA Min Euoo-sung), who headed Korea operations of now-bankrupt Lehman Brothers investment bank prior to joining KDB, is also questioned. One of Min's first acts as new KDP Chair and CEO was to make a failed bid to purchase Lehman Brothers just days before Lehman's 2008 collapse which - along with the fall of AIG - triggered the global financial meltdown. Min also attempted to purchase Woori Bank while at KDB (Min was previously the Vice-Chair and CFO of Woori), but KDB's takeover of Woori was turned down by Korean regulators. Min would again attempt another unsuccessful takeover of Woori when he became chairman of a private equity firm called TStone Corp. in 2012. It is noteworthy that Chan's predecessor as RCI CFO, Kwong Choo C.G.A., also abruptly quit as RCI Capital's controller in December 2007. Choo's resignation back then (and the rumor was that he also briefly fled the country to his native Singapore) came upon formal notice from the Canada Revenue Agency (CRA) that it was about to conduct an audit of Can-Achieve Consultants Ltd. (CAC). Mr. Choo, strangely enough, was concurrently, controller of both RCI and CAC, despite the companies having formally split in 2006. So, when the CRA announced it would audit CAC in the Fall of 2007, Choo abruptly skipped town, and RCI Capital soon after re-hired former CAC and RCI accountant Arthur Chan to come back to RCI as its CFO. Remarkably, both Choo, and Chan, hide the fact that they were actually chief accountants for Can-Achieve Consultants Ltd. on their LinkedIn profiles and resumes. Up until June 2006 when the two Chinese-Canadian controlling shareholders of the Can-Achieve Group broke up and sold CAC's immigrant investor operations consisting of RCI Capital Group Inc., Renaissance Capital Inc., and Royal Canadian Immigration Consultants Inc. to John Park, CAC had been the real owner of RCI Capital Group. RCI president John Park had up until 2006 only owned 6% of the company until the previous owners Allen Li (also known as Allen Lee, Hong Jun Lee or Hong Jun Li), and Alex Li (no relation), sold their shares in RCI to Park. Both Li's retained pieces of CAC after the 2006 breakup. However, CAC continued to break apart over the new few years to where today it is a shell of its heyday when it was for almost a decade the largest immigration agency in China and Canada. In 2013 John Park and former RCI chairman Allen Li (Li owned 51% of RCI until 2006), formed a new company together called RCI Partners LLC. RCI's long-time tax lawyer Ian Worland set it up and the corporation's registered address is the Vancouver corporate office of Allen Li. KDB's formal cooperation with RCI had stemmed from a March 31 2009 MOU signing ceremony witnessed by RCI Capital Chairman, the Hon. John D. Reynolds, P.C. For some unknown reason, John Reynolds' son Michael Reynolds, a former Howe St. broker and long-time employee of Canaccord Securities, who is now a Zug Switzerland-based investment promoter and managing director of Aries Advisors SA, stayed at the same Seoul Westin Hotel with his father while the senior Reynolds was in Seoul to participate in the RCI-KDB MOU signing and meetings with some of Korea's biggest energy and resource corporations. John Reynolds' other son Paul D. Reynolds, also happens to be an investment banker and is Toronto-based President and CEO of Canaccord Genuity Group Inc., Canada's largest independent brokerage firm. Although John Reynolds was never a Canadian government cabinet minister, he received his coveted Privy Council (P.C.) designation as a political reward for having been National Campaign Co-Chair for the Stephen Harper government's 2006 election win. In South Korean news of the 2009 MOU, Reynolds is described as Chairman of the "RCI Bank of Canada" and he carried a business card with that officious title during his trip to Korea for the RCI-KDB MOU. The problem is, there is no RCI Bank of Canada. It was a complete fiction and puffery or 'smoke and mirrors' intended to boost RCI's credibility in the eyes of foreign investors like KORES it met in Seoul as arranged by KDB in 2009 (see Newstapa video below). For several years, RCI did have ambitious aspirations to eventually file an application to hopefully obtain Office of the Superintendent of Financial Institutions (OSFI) approval for RCI to get a Canadian 'schedule 1' bank charter. Only approval by OSFI would legitimately qualify RCI to operate what would become the "RCI Bank of Canada." However, that never happened. RCI never even filed a formal application with OSFI because it lacked the financial backing to do so. 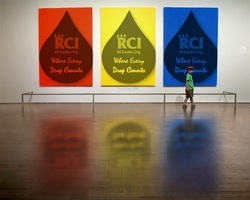 Therefore, the so-called RCI Bank of Canada - in reality - never existed beyond being a private business plan. So how could RCI Capital's Chairman, the 'Honourable' John D. Reynolds P.C., present himself as the chairman of a Canadian bank that did not even exist, and get away with it? Welcome to the RCI Capital Story. Euoo-sung Min is also a former RCI immigrant investor client who previously gained his Canadian permanent resident status via RCI Capital Group subsidiary Renaissance Capital Inc. Min had to relinquish his Canadian permanent residence status in 2008 as a condition of South Korean president M.B.Lee's appointment for him to become the Chair of KDB. The Newstapa probe also revealed that Min's daughter was also hired by RCI Capital to work as a Korea Market Analyst in 2009. The government replaced Min as KDB chair in 2011. KDB promptly cancelled its cooperation with RCI after Min parted ways with the bank. However, Min and Park continued their close cooperation via a private South Korean private-equity investment fund company Min now chairs called TStone Corp.
A spotlight is focused Min's partnership with RCI Capital via TStone Corp. At a May 16 2012 Seoul signing ceremony, British Columbia Premier Christy Clark witnessed what the Premier's office called a formal agreement between RCI Capital, the Harper Government's supposedly independent Sustainable Development Technology Canada (SDTC), and Min's "T-Stone Capital Fund" on what the Premier's press release calls "$300-million worth of matching funding for investment in Canadian clean-technology portfolio companies." A photo of Clark at that signing ceremony briefly flashes on-screen in video of Newstapa's December 2013 broadcast of its RCI probe. How much of this $300 million would come via 'matching funds' from the Canadian tax-payer financed SDTC? Who facilitated the involvement of the Harper government's SDTC in this deal with RCI and T-Stone? Did either of RCI capital directors Stockwell Day, John D. Reynolds, and/or Tenzin Khangsar - all former high-level Harper government insiders - have anything to do with it? At the time of the May 2012 RCI-T-Stone MOU, John Park was quoted in several local Korean language media interviews as boldly lying and misrepresenting that RCI Capital Group has a banking licence in Canada. It does not. Follow the link for just one example. STOCKWELL DAY AND RCI GANG HELP CHRISTY CLARK GET RE-ELECTED. CHRISTY THROWS RCI A BONE WITH INSIDER'S TRACK TO FACILITATE $1 BILLION IN B.C. WOOD PELLETS TO CHINA. IT'S THE CIRCLE OF LOVE, RCI STYLE. In November 2013, for some unknown reason that defies logic, necessity, or convention, British Columbia's Clark government, despite having dozens of professional trade staff in China who could have easily done likewise, contracted the private sector's RCI Capital Group (as represented by former Harper government International Trade minister and Treasury Board president, and now RCI Capital Director/shareholder, the Hon. Stockwell Day P.C. 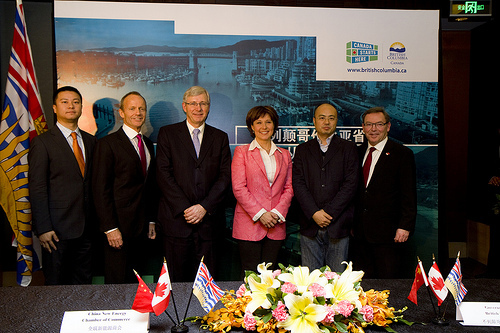 shown here in a 25 November 2013 MOU signing ceremony photo with Christy Clark in Beijing) to intervene as a middleman in effecting a "A memorandum of understanding (MOU) between China New Energy Chamber of Commerce Biomass Energy Industry Association and the Office of the British Columbia Representative in Asia and Investment and Trade Commissioner to further explore trade and investment opportunities in B.C., including but not limited to the forestry industry." The Premier's office purports that the MOU may result in up to $1 billion in timber products exports from B.C. to China. It is assumed RCI would have been paid by the B.C. Government for its services and may even benefit from whatever gross revenues eventually accrue due to private sector deals and exports flowing from the BC Government's MOU with the Chinese agency. To read February 17, 2014 news article about RCI Capital's John Park, Stockwell Day, and Tenzin Khangsar titled, "BC Forests to Fuel China's Energy Needs? Company with influential ex-Tories sees big opportunity in BC wood pellets." CLICK HERE. RCI Capital's Managing Director Tenzin Khangsar, a longtime Harper conservative government political aide and chief architect of Harper immigration minister Jason Kenney's long-term 'ethnic outreach' operations, was an important volunteer member of Christy Clark's May 2013 re-election campaign. Khangsar helped coordinate Harper Conservative election machine efforts to help re-elect Clark's government. As an apparent reward from Clark, despite his only having moved to Vancouver from Ottawa in September 2012, and the fact there must be many qualified British Columbians, newcomer Khangsar was appointed Chairman of the Multicultural Advisory Council of British Columbia as of December 11, 2013 (see TheTyee.ca articles below). Canada Korea Foundation (CKF) while he was still employed as Immigration Minister Jason Kenney's 'Ethnic Outreach' Architect in 2009. Vancouver trial scheduled to begin April 22. Much more to come on this. 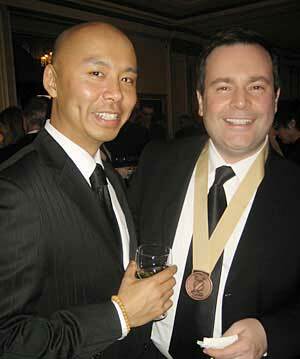 Long-time aide Tenzin Khangsar with CIC minister Jason Kenney in 2009. BC Gov't's New Multicultural Advisor Was Harper Tories' Ethnic Vote Getter Khangsar helped launch troubled, Conservative-backed Canada Korea Foundation. The new chair of the B.C. government's Multicultural Advisory Council, Tenzin Dargyal Khangsar, courted ethnic voters for the Conservatives while working as an aide to federal Citizenship, Immigration and Multiculturalism Minister Jason Kenney, whose portfolio is now Employment, Social Development and Multiculturalism. A high level political player, Khangsar was instrumental in creating the Vancouver-based Canada Korea Foundation (CKF) -- a troubled project that sheds light on Conservative strategies to foster new ethnic organizations friendly to the Harper government. Some details of Khangsar's entwinement with immigrant business and political circles are made visible because of a current court battle among various founding members of Canada Korea Foundation -- a crumbling of alliances that has caused a B.C. Conservative senator to lately publicly distance herself from the organization she helped create. Khangsar was born in Quebec of Tibetan heritage and was National Coordinator of the Canada Tibet Committee when he unsuccessfully ran for the Tories in Brossard-La Prairie in the 2006 federal election. He went to work as a special advisor in the Prime Minister's Office in June 2006. From October 2008 to August 2010 he was Kenney's director of multicultural affairs. His LinkedIn profile does not show where he worked from September 2010 to January 2011, but it indicates he began working under then Industry minister Tony Clement in February 2011 (as Clement's Chief of Staff). The Conservatives won a majority in the May 2011 federal election. Khangsar was hired in October of 2012 to be managing director of RCI Capital Group, a Vancouver-based investment house with a Beijing branch office. The person who hired him was John Park, the Korean-Canadian CEO of RCI Capital Group. Almost two years before the hiring, Khangsar helped Park and two other men form the Canada Korea Foundation, which Park said in court documents was involved in "lobbying the federal government regarding Canada-Korea bilateral relations." Now Park is suing CKF co-founders Charles Kim and Dr. Doo Ho Shin in B.C. Supreme Court to recover his $50,000 contribution. In a transcript from Park's examination for discovery, Park gave his version of what Khangsar is employed to do for his private investment firm. Park testified that Khangsar's "specific responsibility" with RCI is "mainly government relations." RCI manages immigrant investor capital, is involved in energy and resource companies and provides aboriginal trust fund management services. Neither RCI, Park nor Khangsar are listed in the federal lobbying registry. Other high profile Conservatives with ties to RCI include retired MPs Stockwell Day and John Reynolds, who were both active supporters of Premier Christy Clark and the BC Liberals' 2013 re-election campaign. The invention of the Canada Korea Foundation proved advantageously timely for the soon to be election-bound Conservatives. CKF registered Sept. 21, 2010 as a federal corporation under the Canada Corporations Act and Khangsar helped coordinate its Feb. 21, 2011 launch banquet in Burnaby. The featured keynote speaker: Prime Minister Stephen Harper. Just over a month later, after losing a confidence vote in the House of Commons, Harper called an election, set for May 2. Making the launch of CKF, a showcase for Harper was part of Khangsar's vision from an early point, and he made it a motivator as he sought funding for the project. A Jan. 25, 2011 email by Khangsar to CKF directors Park, Kim and Shin said he was working with the Canadian Chamber of Commerce for rights to the name Canada Korea Council (CKC), because CKF did not "plan to give our charitable tax receipts as most foundations do." "Friends, as I am focused on my consultancy practice and my time is literally how I pay my mortgage and family expenses, I must respectfully request that the founding directors of CKC make a decision about next steps," Khangsar wrote. "It is my own view that if we have at least $100,000 to start, we can: navigate a merger with [Canada Korea Business Association]; develop partnership with Hanca Foundation; proceed with the Action Plan; launch of CKC with the PM for late spring-early summer." Khangsar's email mentioned a scheduled Jan. 30, 2011 meeting with Conservative Senator Yonah Kim Martin, an honourary patron of CKF. The CKF launch was accelerated to correspond with Harper's pre-election trip to Vancouver. "That meeting was probably that he had offered to come out and work on the event and we were talking about some of the details of the event," Martin recalled in an interview with The Tyee. In a Feb. 1, 2011 email to Park, Kim and Shin, Khangsar referred to himself as "your advisor." He recommended the directors write $50,000 cheques to CKF, open a bank account and "Join teleconference to plan for PM Harper event-meeting on Feb 21st." The Harper-headlined launch drew more than 300 people, including a dozen cabinet ministers, to the Hilton Metrotown. Nine donors gave CKF $10,000 each, and five of them were hosted at an appreciation lunch the following month at Kamei Royale in downtown Vancouver. Park testified in examination for discovery that the foundation was conceived in fall 2009 "at the encouragement of Sen. Martin and Dr. Shin and Tenzin." He said then Foreign Affairs minister Lawrence Cannon pledged federal support and specifically requested a copy of the CKF proposal be sent to him. Park also testified that he introduced Khangsar to both Shin and Kim in spring 2010, though he said Kim and Khangsar previously knew each other. Kim did not respond to an interview request. "It was after my initiative in establishing the CKF with the support of the Conservative Party government in which Tenzin was -- was a key, I guess, advisor to the government in community outreach -- outreach programs of the government," Park said. "I knew [Khangsar] through my -- my relationship with the party." Khangsar was never a member or director of CKF, but was described by Park as a "cheerleader of the community." "[Khangsar] encouraged all three of us through multiple meetings," he testified. Park was asked by Kim and Shin's lawyer, Kevin Nakanishi, why Khangsar became involved in the foundation: "Well, first of all I think he believed that our community needed it, and, I guess, secondly it was -- it was part of his job." Park said Khangsar told the three of them that he assisted in the creation of the 2007-established Canada India Foundation, "and that he could do the same for the Canadian Korean Foundation." Repeated phone calls and emails to Khangsar were not returned. Park responded on his behalf and said in an interview that Khangsar's task under Kenney "was to bring in the immigrant vote for the party." "It was a very good strategy by them, first and foremost immigrant communities are saying 'wow, finally someone's talking to us, someone's saying we're Canadian, someone's saying we're important because we've got a vote,'" Park said. "That was, historically, the Liberal Party, but they took it for granted for the last 10 years." But by the fall off 2011, CKF was embroiled in board infighting. On April 27, 2012, Park filed a breach of contract and negligent misrepresentation lawsuit against the other two CKF directors Kim and Shin, and the foundation, after he claimed he put up $50,000 and the others breached a February 2011 verbal contract to do the same. A 14-day trial is scheduled to begin April 22. On November 17 of last year, Martin and Haliburton-Kawartha Lakes-Brock Conservative MP Barry Devolin resigned as honourary patrons of the Canada Korea Foundation, their letter to CKF directors Park, Kim and Shin expressing "wishes for a clear resolution of the legal conflict." Martin's relationship with CKF by then had been bumpy and potentially embarrassing for two years. Court filings include a Sept. 19, 2011 email from Martin through her Yahoo.com address to Park and the CKF board. The email said CKF was the sponsor of a Parliamentary Internship Program "of three capable Korean-Canadian interns from B.C., Alberta and Ontario." CKF's sponsorship collapsed amid the CKF board infighting later that fall. On Nov. 7, 2011, Martin sent an email to Park after she learned that the two interns who were hired had not received their individual $4,000 sponsorship payments. "It is now November, so it is over two months later than originally agreed upon," Martin wrote. "Despite the internal conflict that has unfortunately plagued CKF, I know you will agree that the interns should get their payment. Please confirm the date and time when Ed can pick up the two cheques: for Julie Kim and Ji-Young Kim. And he will Fed-ex the cheques to Ottawa to expedite their cheque delivery." Julie Kim was an intern for Devolin and Ji-Young Kim worked in Treasury Board President Tony Clement's Ottawa office. Park claimed in an affidavit he paid the interns $8,000 "out of my own funds." Sen. Martin told The Tyee the dispute among CKF's directors "is very unfortunate, because they're all fine individuals with whom we'd planned, over a long period of time, on a very wonderful initiative that would help represent the Korean-Canadian community and some of the important bilateral issues." In December 2013, Khangsar was appointed to head the Multicultural Advisory Council that advises Teresa Wat, the BC Liberals' International Trade and Multiculturalism minister. For link to video of Conservative Prime Minister Stephen Harper's speech at February 21 2011 CKF launch, in which Harper praises John Park and endorses the goals of CKF (and RCI) to foster more Korean investment into Canada's energy and resource sectors, CLICK HERE. (CCRDF), another private, yet Harper government-supported, 'resource and energy sector' business promotion vehicle that RCI created in 2009. Contrary to John Park's claims in TheTyee.ca's February 18, 2014 article and court proceedings about the Canada Korea Foundation (CKF), Immigrant Investor Program financier John Park of RCI Capital Group Inc. and Renaissance Capital Inc., along with future RCI Capital managing director Tenzin Khangsar, who in 2009 was still working for Harper immigration minister Jason Kenney, conspired together in mid 2009 to create what would become the RCI-established and controlled Canada Korea Foundation. 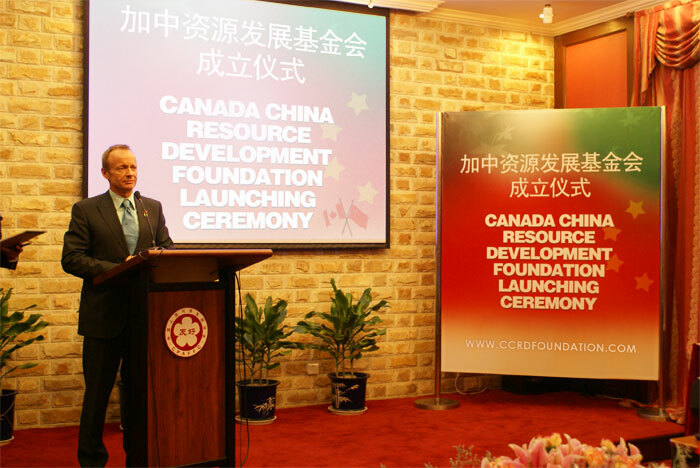 The CKF was actually modeled on another RCI-established and soon-after to fail private foundation RCI established called the Canada China Resource Development Foundation (CCRDF). Park's control and use of the CCRDF to promote RCI's corporate interests would fail because - the very next month - Park would force fellow RCI directors Fred and Linan Eden off of RCI Capital's board. The Edens then retained control of the CCRDF after their long-time relationship with Park soured. Harper government international trade minister Stockwell Day, who would go on to become a RCI Capital Group Director and shareholder in 2012 (and made a director of CKF by Park without the knowledge or consent of fellow CKF directors in 2011), would for some reason take time out from his busy schedule while accompanying Canadian prime minister Stephen Harper on his first official visit to China on December 3, 2009, to officiate in the Official Launch ceremony of RCI Capital's CCRDF. He joined John Park and RCI Capital's Chairman, the Hon. John D. Reynolds P.C. (Reynolds was the Conservative Party of Canada's national campaign co-chair for the 2006 election that swept Stephen Harper's government into power), at the CCRDF ceremony in Beijing. 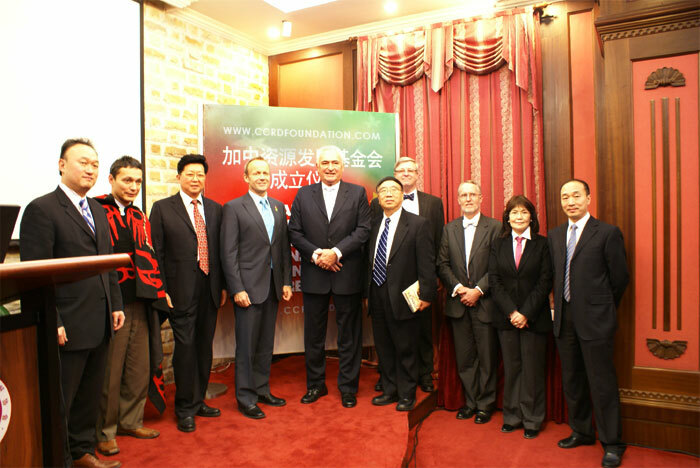 Canada's Ambassador to China also attended the private function. The CKF would prove to be a valuable ethnic outreach vehicle for the Harper Conservatives, but also a vehicle to promote the corporate and political interests of John Park's RCI Capital Group. Park's plans unraveled when two fellow CKF directors apparently began to 'smell a rat' in Mr. Park's use of the CKF solely for his own partisan and corporate interests. The province's Multicultural Advisory Council has a new Chairman. Veteran federal Conservative aide Tenzin Dargyal Khangsar was appointed by cabinet on Dec. 11 for a two-year term. The Quebec-raised, Tibetan-Canadian ran a third-place campaign as a Conservative in the Brossard-La Prairie riding during the 2006 federal election. For the next six years, he held a succession of Parliament Hill postings, including chief of staff to Citizenship, Immigration and Multiculturalism Minister Jason Kenney and Treasury Board president Tony Clement. 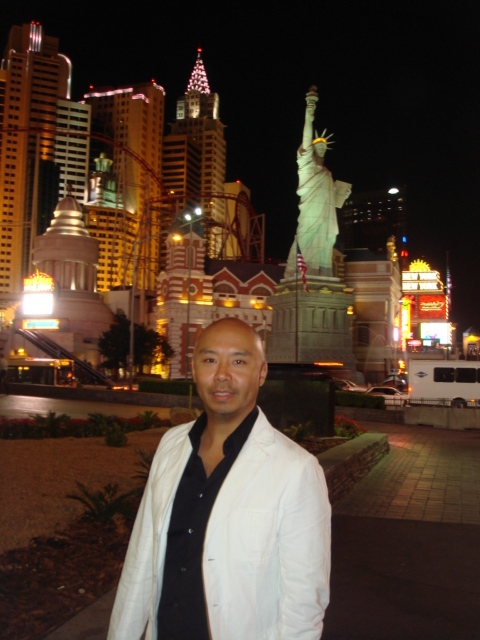 Since September 2012, Khangsar has worked as managing director and executive vice-president of Vancouver-headquartered RCI Capital Group Inc. On its website, RCI claims to be the largest manager of immigrant investor capital in Canada, is involved in junior and mid-market energy and resource companies and provides aboriginal trust fund management services. RCI president John Park's board includes Clark supporter Stockwell Day, whose federal Conservative cabinet duties under Prime Minister Stephen Harper included International Trade. The B.C. Office of the Registrar of Lobbyists shows no current entries for RCI, but two well-known Liberal names are listed in the archives as ex-RCI lobbyists. Clark's then-husband Mark Marissen lobbied for RCI from September 2007 to September 2008. Andrew Wilkinson, who became minister of Technology, Innovation and Citizens' Service last June, was retained by RCI from June 2007 to November 2009. A video crew from Newstapa, the Korea Center for Investigative Journalism, recently visited Vancouver to probe RCI's role in the 2011 Capstone Mining Corp. takeover of Far West Mining Ltd., which involved Korea Resources Corp. (KORES). RCI donated $11,500 from 2011 to 2013 to the BC Liberals, including $5,000 to Kevin Falcon's leadership campaign in 2011. In 2013, the company donated $4,500 to unsuccessful Coquitlam-Maillardville BC Liberal candidate Steve Kim. Kim was appointed to a two-year term as a director on the Khangsar-chaired MAC on Dec. 31. Kim is a former chair of the C3 Korean Canadian Society, which was founded by 2009-appointed Tory Senator Yonah Martin. Vancouver journalist Bob Mackin is a frequent contributor to The Tyee. Find his previous stories published by www.TheTyee.ca here. RCI Leaks.Org Note: Khangsar’s RCI Capital Group sponsored Yonah Martin and Steve Kim’s ‘C3 Leadership Conference’ in 2013. RCI President John Park gave keynote address. 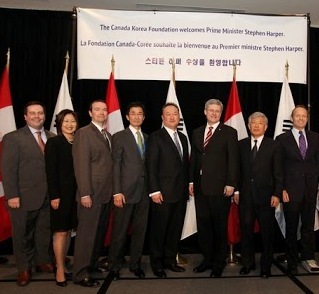 Korean-Canadian Senator Yonah Kim-Martin is also ‘Honorary Patron’ of the Stephen Harper-endorsed Canada Korea Foundation (CKF) which then Kenney aide Khangsar helped RCI Capital Group establish in February 2011. John Park was self-appointed founding Chairman of the CKF (but was removed following a legal dispute with fellow directors that is before the courts in 2013-4). RCI Capital Group director and shareholder Stockwell Day is also a CKF director. Very interesting are the ties that bind. "We want to meet him. "~@Newstapa reporter (referring to @RCI_Capital's @JohnParkRCI as they stakeout his house after he avoided them at office). 뉴스타파 특별기획 MB의 유산 - 7부 또 다른 복마전, 자원외교 (2013.12.17) http://www.youtube.com/watch?v=yuCg1vKXbOI ➨ See 14:02 in video. - and a great sense of justice. (26.09.2012 Reykjavík) Irreverent Canadian corporate whistle blower site RCILeaks.Org and its staunchly loyal Icelandic internet service provider OrangeWebsite.com today announced they won a landmark free speech court case in the Reykjavík District Court (Héraðsdómur Reykjavíkur) while defending themselves against Vancouver and Montreal-based RCI Capital Group Inc. (plus Renaissance Capital Inc.), and RCI owner John Park's failed bid to take down and silence whistle blower sites RCILeaks.Org and QuitRCI.com. Sassy RCILeaks.Org is ably hosted by freedom of speech defender OrangeWebsite.com on servers in Reykjavík, as well as being co-located on mirror sites in Europe. Iceland is a celebrated global haven for whistle-blowers and digital free speech. Be sure to click here to read the media release. Stockwell Day understandably keeps his new relationship with Vancouver's RCI Capital Group on the down-low. RCI Director and paid adviser Stockwell Day understandably keeps his relationship with RCI on down-low. But here he is shilling Canadian coal deal to South Koreans (July 2012). 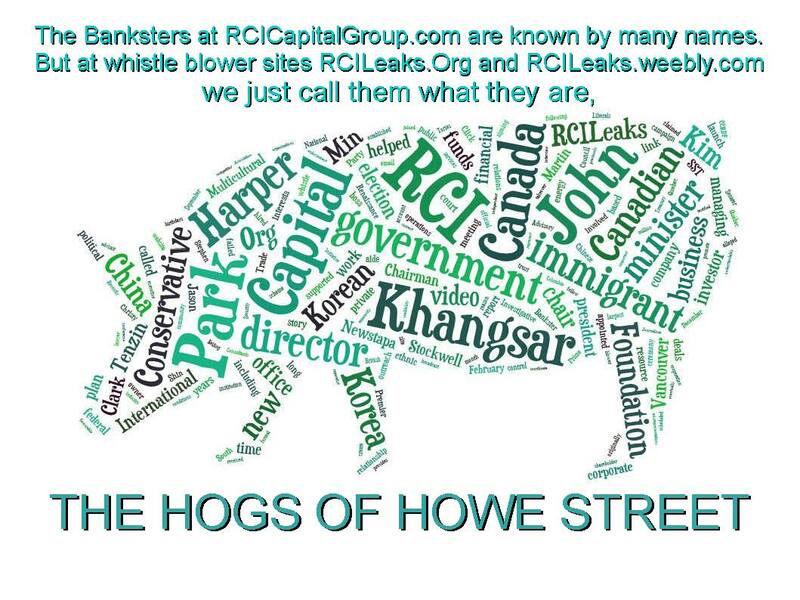 RCI Capital Group Inc. (Royal Canadian Immigration or 加拿大皇家投资集团) boss John Park, who hired Hon. John D. Reynolds PC - the Conservative Party of Canada's 2006 election campaign co-chair - to become a board member and act as non-executive Chairman of RCI as of 2008, has confided to insiders that he was being groomed and plans to run as a Conservative candidate for parliament during the 2015 Federal election in Canada. Fat chance. If an unsuspecting riding association or party officials were to entertain that possibility, it is highly doubtful he could even secure a nomination after proper vetting and due diligence. Former Harper government International Trade Minister & Treasury Board Chair Stockwell Day also joined RCI as a director and paid adviser in early 2012. His primary role seems to be to lend 'credibility' to RCI efforts to broker Canadian mining and natural resource M&A deals abroad to Asian governments, sovereign funds & corporations. Right-wing Tibetan-Canadian Tenzin Khangsar is a close friend of John Park and former Chief of Staff to senior Harper ministers Tony Clement (Treasury Board) and Jason Kenney (Immigration). Khangsar 'officially' joined RCI as of September 2012. He is Executive Vice President and Managing Director. There is evidence indicating that - prior to leaving government - Khangsar was very instrumental in advancing RCI and Park's corporate interests within Harper government circles (more details to come). Recently Park was self-appointed founding President of the Harper Government-supported Canada Korea Foundation, an 'ethnic outreach' vehicle set up with the direction of then 'ethnic-outreach experpt' Jason Kenney aide and Conservative Party of Canada operative, Tenzin Khangsar, to pander to South Korean business community and also enhance the visibility and 'credibility' of John Park's own business and political profile. The Prime Minister's website features photos of Park beside Harper and flanked by several Conservative government MPs and senators (including Tenzin Khangsar's then boss - Jason Kenney - and soon-to-be RCI director Stockwell Day (2012). A February 21, 2011 Harper speech posted on Harper's site even contains a two-paragraph ringing endorsement of John Park. The speech includes an inaccurate claim that "RCI is the largest 'manager' of immigrant investor capital in Canada." RCI does not manage any immigrant investor funds; the government does. Moreover, Desjardins Financial (followed by National Bank) is by far the largest financial intermediary in Canada's immigrant investor market, whereas RCI perhaps ranks seventh in terms of sales only. Still, nice accolades from a Prime Minister for any aspiring politician. But does Park have the right stuff to hold public office? Not so fast. In the public interest, and with the firm belief that neither his business shenanigans nor his character meet the bar for what is needed in someone entrusted to hold public office, RCILeaks.Org has dedicated this website to make absolutely sure any major political party's vetting committee will have full access to all the information it needs to nip Mr. Park's plans in the bud long before an inevitable loss at the polls. Canadians deserve absolutely nothing less than the highest integrity in the personage of their elected representatives. So then. Sorry Johnny. Not in this lifetime. Say What? C'est quoi cette sedition? 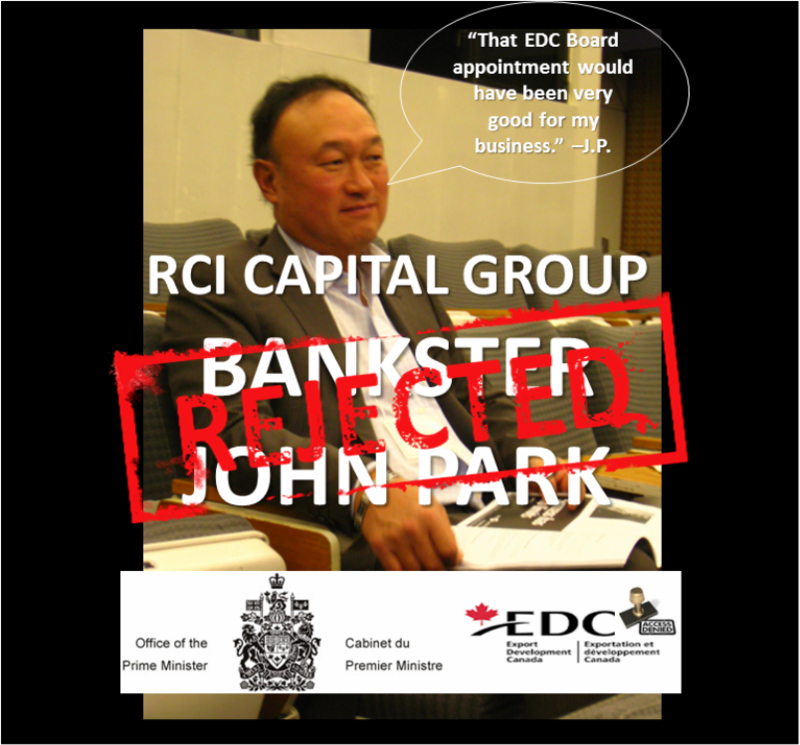 Click on the little green alien to read all about RCI owner John Park's completely bizarre and failed scheme to get RCI's competitor - Desjardins Financial Group - banned from doing business in China. RCI's aborted plan to falsely claim that the much respected Quebec-based and Canada-wide financial institution supported nationalist, separatist, economic and political independence movements of the disputed regions of Taiwan and Tibet, and was therefore somehow a threat to China's national security interests. Ironically, RCI's Montreal office receives significant Quebec tax credits via its status as a designated International Financial Centre as authorized by the Government of Quebec. Desjardins is a 46,000 employee, depositor-owned cooperative with over 5,600,000 members. Mr. Park's treacherous scheme, as failed and petty as it was, is still nothing less than treasonous sedition that would have certainly undermined relations between Québec, Canada and China, had he been successful in implementing his nefarious scheme as he originally planned. Moreover, it would have seriously harmed the business interests of Desjardins, Québec's largest financial institution. Click here to watch the world premiere webisode of "Scheming Korean-Canadian Bankster Boss caught on Video." Cliquez sur l'image pour voir "Scheming boss Bankster canadienne d'origine coréenne pris sur la vidéo." Oh là là, c'est de la merde âne fou. Mon Dieu! Chick here to scan highlights of 86-pg. Affidavit Exhibit D - "Desjardins & Quebec Separatist Movement Research", (Calgary Public Library EIS), 14.8.2007. Click here to read 8-pg. sworn affidavit about John Park's failed plot to have financial institution competitor Desjardins banned from China. Cliquez sur le petit extraterrestre vert pour tout savoir sur schéma complètement bizarre et défaillants RCI propriétaire John Park pour obtenir concurrent de RCI - Desjardins Financial Group (le Mouvement des caisses Desjardins) - interdit de faire des affaires en Chine. Le plan avorté de RCI pour faire croire que le très respecté basée au Québec et partout au Canada institution financière (un employé de 46.000, déposant coopérative détenue par plus de 5.600.000 membres) supporté nationaliste taïwanais et les séparatistes tibétains et était donc en quelque sorte une menace pour les intérêts de la Chine à la sécurité nationale . Ironie du sort, le bureau de RCI Montréal reçoit d'importants crédits d'impôt du Québec par l'intermédiaire de son statut de centre financier international désigné comme autorisé par le gouvernement du Québec. Régime traître de M. Park, comme ayant échoué et la petite qu'elle était, est encore rien de moins que la sédition trahison qui aurait certainement sapé les relations entre le Québec, le Canada et la Chine, avait-il réussi à mettre en œuvre son plan néfaste comme il avait initialement prévu. En outre, elle aurait gravement nui aux intérêts d'affaires de Desjardins, la plus importante institution financière du Québec. RCILeaks Notice: Please assure RCI's litigation lawyers' children remain fatty and well fed by reporting any disabled video links to anonymou5. Be comforted that every time you report an inactive video link to us and we repair it, another litigation lawyer hears a bell (cha-ching) because they know RCI will have to pay them to fruitlessly try to take the links down - again and again. RCILeaks.Org is here to stay and we will never be silenced. Hear us roar! Occupy RCI. Read all about it here. And be sure to watch and share the shocking videos. June 16, 2009: Beijing news conference calling for national boycott of RCI for illicit brokering activities. The Exit & Entry Division of the Chinese Public Security Bureau, which regulates the entire Chinese immigration agent industry, also issued an advisory (never retracted) for China's licensed agencies to avoid doing business with RCI. Shanghai Exit and Entry Administration announces remediation against RCI alleged illegal operations: leading to police investigation of RCI in China, closure of RCI offices for 6 months, plus Royal Bank of Canada (RBC) and Bank of China (BOC) ending financing relationships with RCI. The Real Story behind an innocent young RCI lawyer's 8 month ordeal in Chinese jail as he unwittingly became victim of his employer’s misdeeds. This story never reported by MSM. 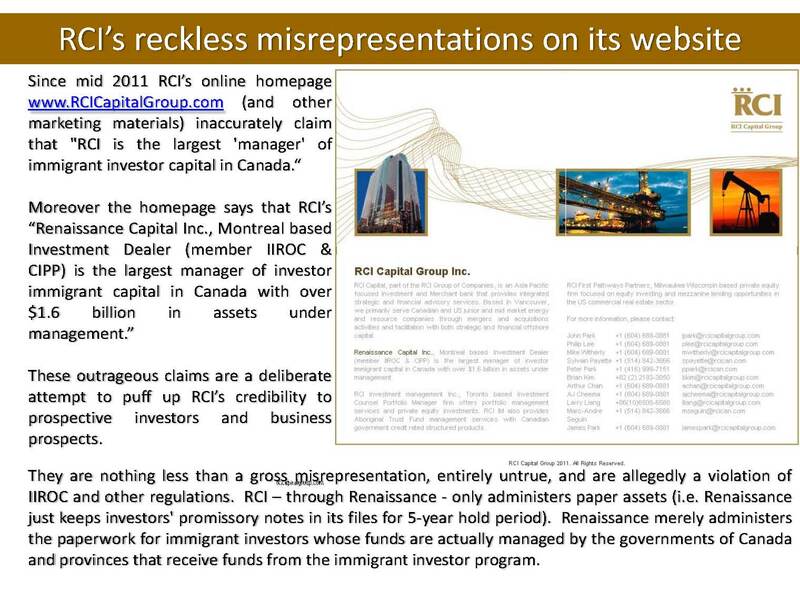 How RCI risked immigrant investor funds by improperly holding them in its Vancouver corporate account instead of escrow account of IIROC -regulated Renaissance Capital Inc. in Montreal (with whom the investors had their investment agreements). 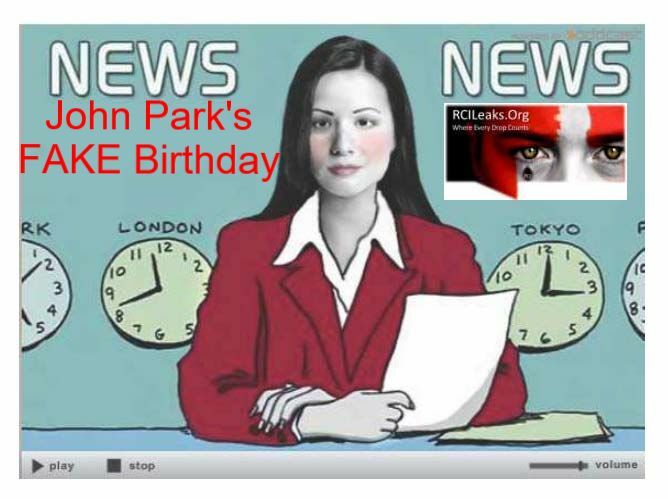 The story behind John Park's two birthdays - one fake and one real (click to see video). Why Many Staff Quit RCI (and why you should too). 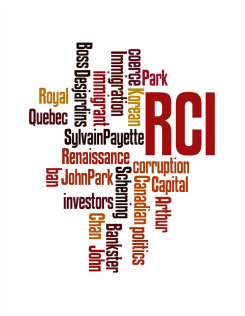 See what Renaissance Capital Inc. president Sylvain Payette allegedly knew about RCI immigration irregularities and fraud. RCI boss John Park's thwarted plan to bribe Chinese police (updated). Serious misrepresentations on RCI Capital Group websites. Coming soon: How RCI allegedly played 'bait & switch' game to get access to management of First Nation trust funds. Take Our Honey Boo Boo Man Survey! JOHN PARK HAS TWO BIRTHDAYS. ONE FAKE AND ONE REAL. "This just in. 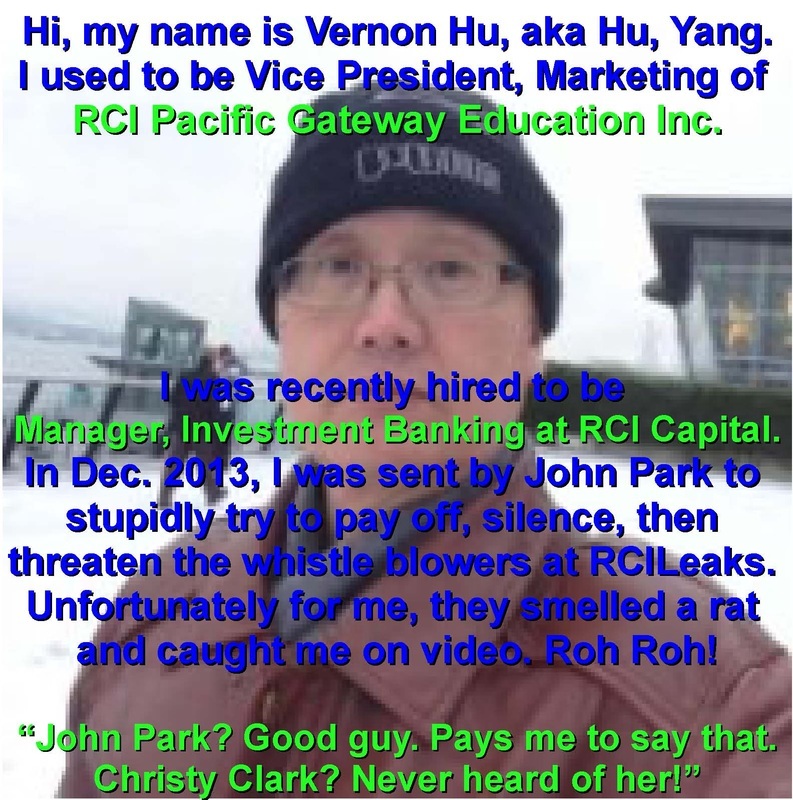 Turns out that reputed Bankster boss John Park of RCI Capital Group in Vancouver Canada, has 2 birthdays; 1 fake and 1 real. Interesting. October 14, 1961 is the fake birthday cited on Park's falsified Canadian passport while his real B day is in August. How is this you ask? Seems when Park immigrated from South Korea to Canada as a 10-year old boy, a mistake was made on immigration documents, and Park NEVER, EVER, EVER, saw fit, to correct it. How ironic that Mr. Park would later grow up to become a known immigration industry Fraudster and Bankster. INDEED." "This just in. 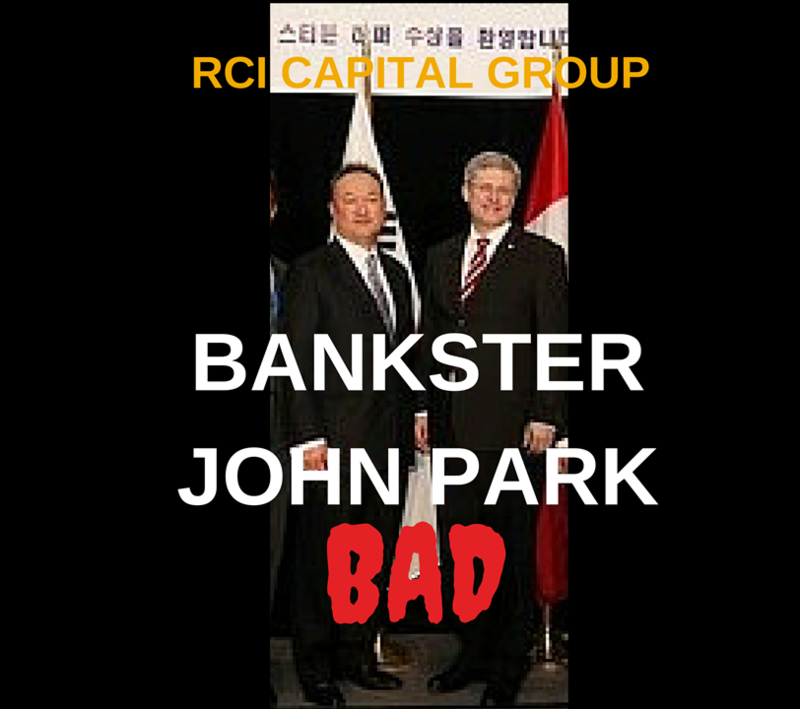 Turns out that RCI Capital Group owner and reputed bankster boss John Park has two birthdays; one fake and one real. Interesting." Click image to see video. whistle and dance the shimmy, and you've got an audience." Just whistle while you work. And cheerfully together we can tidy up the place.So hum a merry tune. It won't take long when there's a song to help you set the pace.